X Aunque su cuerpo es extremadamente delgado, es muy rápido a la hora de capturar sus presas. X Sebbene abbia un corpo magrissimo, sa essere molto rapido quando si scaglia sulla preda. X 홀쭉한 체격이지만 먹이를 잡을 때의 움직임은 눈에 보이지 않을 정도로 빠르다. Y Tiene cara de persona. Por el aspecto que tiene se ha comentado que podría ser algún tipo de mandrágora legendaria. Y Il bocciolo somigliante a un volto umano fa ritenere che si tratti di un leggendario esemplare di mandragola. Y 사람 얼굴 같은 봉오리 때문에 전설의 꽃 만드라고라의 일종이 아닐까 하는 소문이 돌고 있다. 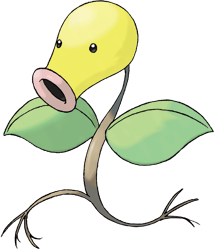 Omega Ruby Bellsprout’s thin and flexible body lets it bend and sway to avoid any attack, however strong it may be. From its mouth, this Pokémon spits a corrosive fluid that melts even iron. Omega Ruby Knofensas schlanker und elastischer Körper ermöglicht es ihm, jeglichem Angriff auszuweichen, so heftig dieser auch sein mag. Dieses Pokémon spuckt eine ätzende Flüssigkeit aus, die sogar Eisen zersetzen kann. Omega Ruby Le corps long et flexible de Chétiflor lui permet de se tordre et d’osciller pour éviter tout type d’attaque, même les plus puissantes. Ce Pokémon crache un fluide corrosif qui peut même dissoudre le fer. 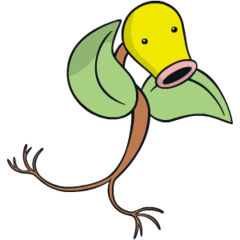 Omega Ruby Bellsprout tiene un cuerpo delgado y flexible que le permite inclinarse y balancearse para esquivar los ataques. Este Pokémon escupe por la boca un fluido corrosivo capaz de hacer que se derrita hasta el hierro. Omega Ruby Il corpo esile e flessibile di Bellsprout gli consente di piegarsi e oscillare per evitare ogni attacco, anche violento. Dalla bocca sputa un fluido corrosivo in grado di sciogliere anche il ferro. Omega Ruby 가늘고 유연한 몸은 아무리 강한 공격이라도 휘어져 피할 수 있다. 입에서 철도 녹일 수 있는 액체를 뿜는다. Alpha Sapphire Bellsprout’s thin and flexible body lets it bend and sway to avoid any attack, however strong it may be. From its mouth, this Pokémon spits a corrosive fluid that melts even iron. Alpha Sapphire Knofensas schlanker und elastischer Körper ermöglicht es ihm, jedem Angriff auszuweichen, so heftig dieser auch sein mag. Dieses Pokémon spuckt eine ätzende Flüssigkeit aus, die sogar Eisen zersetzen kann. Alpha Sapphire Le corps long et flexible de Chétiflor lui permet de se tordre et d’osciller pour éviter tout type d’attaque, même les plus puissantes. Ce Pokémon crache un fluide corrosif qui peut même dissoudre le fer. Alpha Sapphire Bellsprout tiene un cuerpo delgado y flexible que le permite inclinarse y balancearse para esquivar los ataques. Este Pokémon escupe por la boca un fluido corrosivo capaz de hacer que se derrita hasta el hierro. Alpha Sapphire Il corpo esile e flessibile di Bellsprout gli consente di piegarsi e oscillare per evitare ogni attacco, anche violento. Dalla bocca sputa un fluido corrosivo in grado di sciogliere anche il ferro. Alpha Sapphire 가늘고 유연한 몸은 아무리 강한 공격이라도 휘어져 피할 수 있다. 입에서 철도 녹일 수 있는 액체가 나온다. Red A carnivorous Pokemon that traps and eats bugs. It uses its root feet to soak up needed moisture. Blue A carnivorous Pokemon that traps and eats bugs. It uses its root feet to soak up needed moisture. Yellow Prefers hot and humid places. It ensnares tiny insects with its vine and devours them. Stadium A kind of bug-eating plant that hunts small insects. It uses its roots as feet for walking. Gold Even though its body is extremely skinny, it is blindingly fast when catching its prey. Silver It plants its feet deep underground to replenish water. It can't escape its enemy while its rooted. Stadium2 Even though its body is extremely skinny, it is blindingly fast when catching its prey. Ruby Bellsprout's thin and flexible body lets it bend and sway to avoid any attack, however strong it may be. From its mouth, this pokemon spits a corrosive fluid that melts even iron. Sapphire BELLSPROUT's thin and flexible body lets it bend and sway to avoid any attack, however strong it may be. From its mouth, this POKeMON spits a corrosive fluid that melts even iron. Emerald A BELLSPROUT's thin and flexible body lets it bend and sway to avoid any attack, however strong it may be. From its mouth, it leaks a fluid that melts even iron. Pearl It prefers hot and humid environments. It is quick at capturing prey with its vines. Platinum It prefers hot and humid environments. It is quick at capturing prey with its vines. SoulSilver It plants its feet deep underground to replenish water. It can’t escape its enemy while it’s rooted. White It prefers hot and humid environments. It is quick at capturing prey with its vines. White 2 It prefers hot and humid environments. It is quick at capturing prey with its vines.